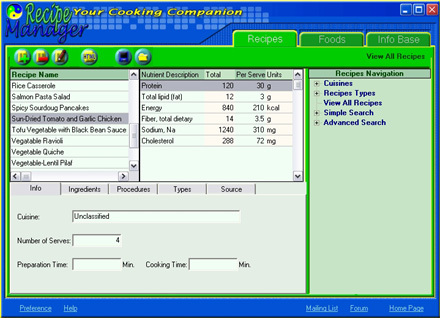 A free and easy-to-use Recipe Database Management System to assist you in organizing your recipes and help you in analyzing the nutritional values of your meals. It contains a large database of ingredients and their nutrient values (over 100 nutrient, micronutrient, mineral and vitamin). This Software is ideal for any person concerned about their health or involved in Fitness, Diet and Nutrition.